We see patients with toxic alcohol poisoning most commonly in three clinical scenarios. One, which is usually relatively straightforward, after an intentional suicide attempt where they tell you exactly what they took; the next scenario is a bit more challenging – when they come in agitated and won’t give you a history and the third – also very challenging – the inebriated patient found down. Alcohol is everywhere, and inevitably inebriated people show up at your ED with a myriad of medical and psychiatric problems – we’re all familiar with these patients. Or they are simply very drunk. And most of them just need to sober up and can be sent home. But, it’s our job as ED professionals, not only to identify traumatic, medical and psychiatric catastrophes in these patients but also to identify and manage the relatively rare but potentially life and sight threatening toxicologic diagnoses in the inebriated or agitated patient. And that isn’t so easy – especially when it comes to toxic alcohols. 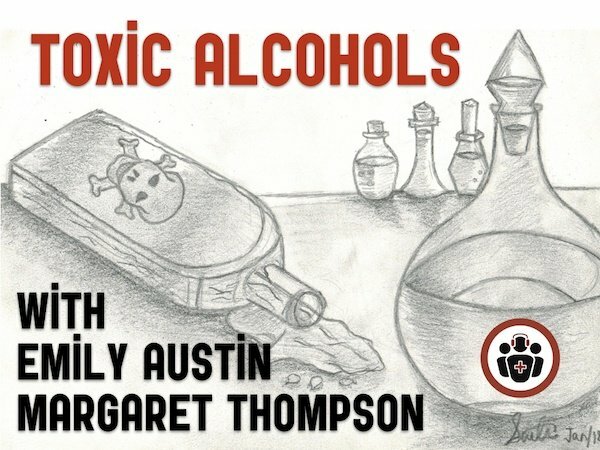 Cite this podcast as: Helman, A, Thompson, M, Austin, E. Toxic Alcohols – Minding the Gaps. Emergency Medicine Cases. January, 2018. https://emergencymedicinecases.com/toxic-alcohols/. Accessed [date]. The toxic alcohols are methanol and ethylene glycol, which can both cause a scary anion gap metabolic acidosis in the first group and ethanol and isopropyl alcohol which aren’t quite as scary and generally don’t cause a big anion gap metabolic acidosis in the second group. Methanol is commonly found in windshield-wiper fluid and de-icing products, as well as paint removers, shoe dyes embalming fluid, and surprisingly a number of Windex products. Ethylene glycol is typically found in radiator antifreeze, degreasing agents, foam stabilizers and metal cleaners. Diethylene glycol is also found in some anti-freeze products, and has caused outbreaks of renal failure after being inadvertently being substituted for sucrose. Isopropanol is found in rubbing alcohol, hand sanitizer gels and other antiseptic preparations. Practical Pearl: Call your local poison control center and request a product identification for products that you are unsure of the the contents. Put simply, methanol and ethylene glycol get metabolized into acids which lead to optic neuritis (methanol) ATN/ARF (ethylene glycol) requiring specific treatments, while isopropyl alcohol gets metabolized into acetone which generally requires supportive treatment only. While most toxic alcohol ingestions are recognized either on history or the finding of an anion gap metabolic acidosis, there are sometimes clinical clues that, if recognized, can lead to early initiation of time sensitive treatments. Early signs of both methanol and ethylene glycol toxicity are the same as for ethanol. When the alcohol is absorbed, before it is metabolized, these substances do cause GI upset (potentially nausea and vomiting), inebriation, slurred speech, nystagmus etc. As the alcohol is metabolized to an acid, hypotension develops, tachycardia, tachypnea, fixed dilated pupils for methanol, depressed level of awareness and potentially seizures. The symptoms usually develop over 6-24hrs but can be delayed up to 4 days if ethanol is coingested. Tachypnea in absence of respiratory illness caused by patient’s effort to blow off CO2 with their metabolic acidosis. Visual changes with methanol include the classic ‘snowstorm’ vision, blurry vision and ultimately blindness with fixed dilated pupils. The finding of extraocular movement paralysis with ethylene glycol is a very late finding and rarely seen in the ED. Not sobering up as expected. Seizure may occur with severe toxic alcohol poisoning late in the presentation. Blood tests should not necessarily be ordered on every inebriated patient in the ED. For patients with any suspicion for a toxic alcohol ingestion, consider ordering a venous blood gas, calculated anion gap, osmolality, BUN, electrolytes and ethanol to calculate an osmolar gap, lactate, ketones and ASA level to sort out the anion gap metabolic acidosis and serum calcium. 1.Anion gap metabolic acidosis. Consider your GOLDMARK differential diagnosis of AG metabolic acidosis (download PDF of GOLDMARK mnemonic). Ethylene glycol may cause renal failure with an elevated creatinine contributing to the AG metabolic acidosis, while both methanol and ethylene glycol may cause an elevated lactate. Note that very early after ingestion an anion gap metabolic acidosis has not had time to develop. Absence of an anion gap metabolic absence does not rule out toxic alcohol poisoning. Clinical Pearl: The differential for a metabolic acidosis with a very low bicarbonate level of 1 or 2 is small – severe sepsis, metformin induced and toxic alcohols. 2.High osmolality and osmolar gap. Limitations of Osmolar Gap: If a patient at baseline has a osmol gap of -14, and now has a osmol gap of 10, they have a elevated Osm Gap, even though it is considered normal by textbook definition. Sick patients from a variety of causes can have baseline osmol gap between +10 to +20. In fact, a majority of patients with an elevated osmolal gap will not have toxic alcohol poisoning. As the toxic alcohol is being metabolized to acid, the osmolarity decreases so that by the time you draw your blood work, the osmolar gap may be normal. High osmolar gaps are generally only seen early after toxic alcohol ingestion. Overall, the osmolar gap has poor positive and negative predictive value for toxic alcohol poisoning. Key concept: The acidosis and osmolality in toxic alcohol poisoning are inversely related. As the patient becomes more acidotic the osmolality decreases so that a normal osmolar gap does not rule out toxic alcohol poisoning. Think of their relationship like a pair of hockey sticks in a cross formation. 3.Low ethanol level in an intoxicated patient. While an ethanol level does not need to be drawn in every patient who presents to the ED inebriated, the serum ethanol may be a clue to a toxic alcohol ingestion. The patient with a decreased LOA with a negligible ethanol concentration must be investigated for other pathology. Ethanol is metabolized at the rate of ~ 5.5 mmol/L/hr in an induced patient. You can predict when the serum ethanol level should be low enough for that patient to mobilize safely out of the ED. If the patient is not improving in that estimated time, rethink the diagnosis and re-assess. For the toxic alcohol ingestion patient, who has co-ingested ethanol, the patient has treated themselves (for the time being), and does not need another intervention. Finally, the serum ethanol must be taken into account when calculating the osmolar gap. Pearl: The triad of acidosis, high osmolality and low or zero ethanol level is highly suspicious for a toxic alcohol ingestion. 4.Hypocalcemia with a prolonged QT is sometimes seen with ethylene glycol toxicity as the calcium is bound to oxalate and deposits in the kidneys causing renal failure and in the brain causing the late findings of parkinsonism and basal ganglia hemorrhages. 5.Bilateral basal ganglia hemorrhages on CT (late finding) with ethylene glycol ingestion. Note that urinary calcium oxalate crystals have very poor sensitivity and specificity for ethylene glycol toxicity and are therefore rarely helpful in the ED. In addition, wood’s lamp examination of urine to detect fluorescein is rarely helpful in detecting ethylene glycol poisoning, with frequent false negatives and false positives making the test unreliable. A delay in initiating treatment of toxic alcohol poisoning leads to worse outcomes. Do not wait for serum toxic alcohol levels to initiate treatment. Note that there is a paucity of high level evidence for the following recommendations. Modify airway management for severe acidosis: Consider delayed sequence intubation with ketamine if your patient is deemed an aspiration risk and beware of the acidosis; match the pre-intubation respiratory rate with post intubation respiratory rate and consider bicarbonate boluses to avoid worsening acidosis and cardiovascular collapse. Call your local poison control center +/- nephrology early. Prevent toxic metabolites: Consider fomepizole ideally within 30 minutes. If you do not have access to fomepizole, consider ethanol. Ethanol dosing: oral ethanol q1h to a target serum ethanol level = 22-23 mmol/L. Note that if the patient comes in having co-ingested ethanol, they will not require fomepizole or additional ethanol as long as their serum ethanol remains above 22-23 mmol/L. Replenish cofactors: Folic acid (50mg IV q4-6h) or folinic acid (1-2mg/kg IV q4-6h) for methanol; thiamine (100mg IV q6h) and pyridoxine (100mg IV q6h) for ethylene glycol. Correct acidosis with a bicarbonate infusion to target pH = 7.2. Consider dialysis: Dialysis may not be required if fomepizole is started early in ethylene glycol poisoning assuming there is no acidaemia or renal dysfunction. Methanol is eliminated too slowly for antidotal treatment alone to be effective and so usually requires dialysis. Note that there is little, if any, role for GI decontamination in toxic alcohol ingestion because of rapid gastric absorption. NG suction may be considered within 30 minutes of ingestion. Pitfall: A delay to dialysis in methanol poisoning is a common pitfall leading to poor outcomes. Call your nephrologist early! Isopropyl alcohol, while techically is not a toxic alcohol, can cause morbidity and mortality and is more commonly ingested than the toxic alcohols. Isopropyl alcohol poisoning presents similarly to ethanol poisoning only more severely with coma and cerebellar signs, and it has more of a predilection for hemorrhagic gastritis and pancreatitis. Don’t ignore abdominal complaints in patients with a history of alcohol misuse! Isopropyl alcohol is about twice as inebriating as is ethanol (for any particular load or blood level) and lasts twice as long. Kraut JA, Mullins ME. Toxic Alcohols. N Engl J Med. 2018;378(3):270-280. Gennari FJ. Current concepts. Serum osmolality. Uses and limitations. N Engl J Med. 1984 Jan 12;310(2):102-5. Review. Hoffman RS, Smilkstein MJ, Howland MA, Goldfrank LR. Osmol gaps revisited: normal values and limitations. J Toxicol Clin Toxicol 1993; 31:81. Buckley NA, Whyte IM, Dawson AH. 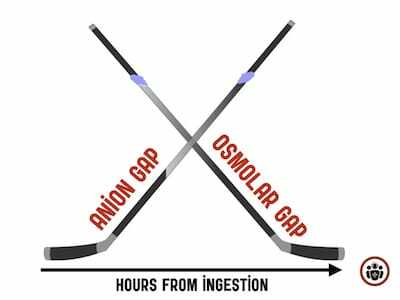 Utility of the osmolal gap. J Toxicol Clin Toxicol 1994; 32(1):93-95. Fraser AD. Clinical toxicologic implications of ethylene glycol and glycolic acid poisoning. Ther Drug Monit 2002; 24:232. Purssell RA, Lynd LD, Koga Y. The use of the osmole gap as a screening test for the presence of exogenous substances. Toxicol Rev 2004; 23:189. Patil N, Becker MWL, Ganetsky M. Toxic Alcohols: Not Always A Clear-Cut Diagnosis. Emergency Medicine Practice 2010; 12 (11). LeBlanc C, Murphy M. Should I stay or should I go? : Toxic alcohol case in the emergency department. Canadian Family Physician 2009; 55(1): 46-49. Jammalamadaka D, Raissi S. Ethylene glycol, methanol and isopropyl alcohol intoxication. Am J Med Sci. 2010 Mar;339(3):276-81. Kraut JA, Kurtz I. Toxic alcohol ingestions: clinical features, diagnosis, and management. Clin J Am Soc Nephrol. 2008 Jan;3(1):208-25. Epub 2007 Nov 28. Marraffa JM, Cohen V, Howland MA. Antidotes for toxicological emergencies: a practical review. Am J Health Syst Pharm. 2012 Feb 1;69(3):199-212. Barceloux DG, Bond GR, Krenzelok EP, Cooper H, Vale JA; American Academy of Clinical Toxicology Ad Hoc Committee on the Treatment Guidelines for Methanol Poisoning. American Academy of Clinical Toxicology practice guidelines on the treatment of methanol poisoning. J Toxicol Clin Toxicol. 2002;40(4):415-46. Recommendations for the Role of Extracorporeal Treatments in the Management of Acute Methanol Poisoning: A Systematic Review and Consensus Statement. Roberts DM et al. Crit Care Med 2015 Feb;43:461-472. Slaughter RJ et al. Isopropanol poisoning. Clin Toxico.2014 May 9. Sinai EM on What’s the gap? Drs. Helman, Austin and Thompson have no conflicts of interest to declare. 1. A 26-year old male presents to your ED with decreased LOC admitting to ingesting a large amount of paint remover. What kind of toxic alcohol poisoning are you concerned about? Methanol is found in windshield-wiper fluid, de-icing products, paint removers, shoe dyes, embalming fluid, and Windex products. Methanol is metabolized into acids which lead to optic neuritis. 2. A 32-year old female presents to your ED with decreased LOC admitting to ingesting a large amount of radiator antifreeze. What kind of toxic alcohol poisoning are you concerned about? Ethylene glycol is found in radiator antifreeze, degreasing agents, foam stabilizers and metal cleaners. Ethylene glycol is metabolized into acids that cause ATN/ARF. 3. A 40-year old male presents to your ED after having ingested a large bottle of hand sanitizer. What kind of toxic alcohol poisoning are you concerned about? Isopropanol is found in rubbing alcohol, hand sanitizer gels and other antiseptic preparations. Isopropanol is metabolized into acetone which requires supportive treatment only. 4. Of the following, which toxic alcohol poisoning causes acute renal failure that will most commonly lead to dialysis? 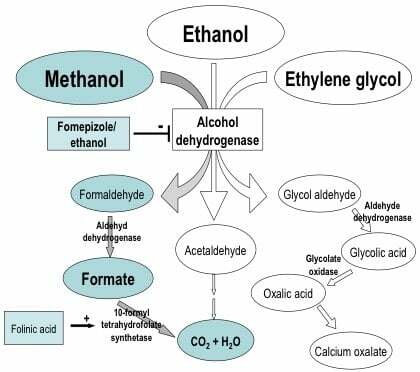 Both methanol and ethylene glycol can both lead to acute renal failure requiring dialysis. Dialysis may not be required if fomepizole is started early in ethylene glycol poisoning. Methanol is eliminated too slowly for antidotal treatment alone to be effective and so usually requires dialysis. A delay to dialysis in methanol poisoning is a common pitfall leading to poor outcomes. Call your nephrologist early! 5. You suspect a toxic alcohol poisoning in your patient who is intoxicated. Which of the following lab results increase your suspicion? The triad of acidosis, high osmolality and low or zero ethanol level is highly suspicious for a toxic alcohol ingestion. 6. You suspect a toxic alcohol poisoning with ethylene glycol. Which of the following findings are not helpful in helping to diagnose ethylene glycol poisoning? D Anion gap metabolic acidosis with a low bicarb of 1-2. Hypocalcemia with a prolonged QT is sometimes seen with ethylene glycol toxicity as the calcium is bound to oxalate and deposits in the kidneys causing renal failure and in the brain causing the late findings of parkinsonism and basal ganglia hemorrhages. Urinary calcium oxalate crystals are rarely helpful in the ED as they have very poor specificity and sensitivity for ethylene glycol poisoning. 7. Your patient has known methanol poisoning with ingestion 1 hour ago. The methanol level is at 9. What is your first step? A Give fomepizole with a loading dose of 15mg/kg. B Give ethanol through the IV. C Start an NG suction. Ethanol should be dosed as oral ethanol q1h to a target serum ethanol level = 22-23 mmol/L. Note that there is little, if any, role for GI decontamination in toxic alcohol ingestion because of rapid gastric absorption. NG suction may be considered within 30 minutes of ingestion. Modify airway management for severe acidosis: Consider delayed sequence intubation with ketamine if your patient is an aspiration risk and beware of the acidosis; match the pre-intubation respiratory rate with post intubation respiratory rate and consider bicarbonate boluses. 9. A 29 year old male presents to the emergency department after accidentally ingesting windshield-wiper fluid 15 minutes ago. He is alert with a GCS of 15. He has an anion gap acidosis with osmolar gap, and has an ethanol level of 0. Which of the following pharmacological agents are preferred to treat him? To prevent toxic metabolites from form in this patient who has methanol intoxication, give fomepizole within 30 minutes of ingestion. Only given ethanol if you do not have access to fomepizole. To replenish cofactors, give folic acid to patients with methanol intoxication, and thiamine to patients with ethylene glycol intoxication. 10. A 34 year old female presents to the emergency department after accidentally ingesting a metal cleaner. She has an anion gap acidosis with osmolar gap. You’ve made the decision to treat her with ethanol because the supply of fomepizole has been depleted in your ED. You also decide to treat her acidosis with sodium bicarbonate infusion. How would you target each of these treatments? When fomepizole is unavailable, give oral ethanol q1h to a target serum ethanol level = 22-23 mmol/L. Correct acidosis with a bicarbonate infusion to target pH = 7.2. 11. A 24-year old male presents to your ED with tachypnea and complains of visual changes for 24hrs. You examine him closely, and his chest is clear on auscultation, a CXR reveals normal lung parenchyma, and there is no evidence of respiratory illness. Of the following lab tests, which one will help you make the diagnosis of toxic alcohol poisoning? You are looking for metabolic acidosis. Tachypnea in absence of respiratory illness caused by patient’s effort to blow off CO2 with metabolic acidosis is an important clinical cue for toxic alcohol poisoning. While serum osmolality is elevate early in toxic alcohol poisoning, it is often normalized as the the illness progresses over time and by 24hrs is usually normal. 12. A patient presents inebriated with GI upset and slurred speech. Which of the following findings is not a clue to toxic alcohol poisoning? If a patient is sobering up as expected, it is likely that they only ingested ethanol. If they are not sobering up as you would expect from ethanol, your index of suspicion for toxic alcohol poisoning should go up. While anion gap metabolic acidosis is usually seen in toxic alcohol poisoning very early after ingestion an anion gap metabolic acidosis has not had time to develop. Absence of an anion gap metabolic absence does not rule out toxic alcohol poisoning. Remember that the acidosis and osmolality in toxic alcohol poisoning are inversely related. As the patient becomes more acidotic the osmolality decreases so that a normal osmolar gap does not rule out toxic alcohol poisoning. A low ethanol level in an inebriated patient should raise your suspicion for toxic alcohol poisoning. Replenishing the co-factors is not a priority of management.